It was entirely appropriate that the UK première of this film should take place at WFA Media and Cultural Centre in Manchester. 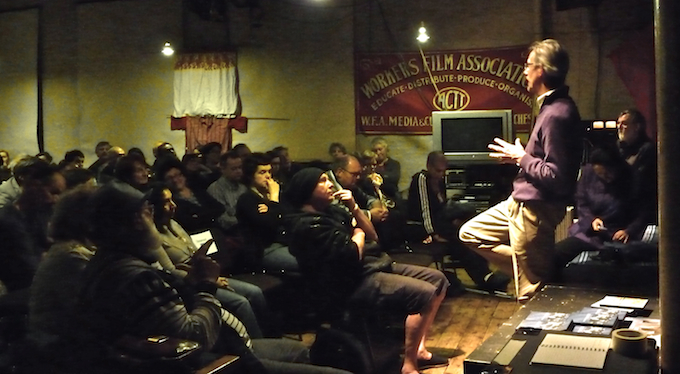 For thirty years and more WFA has been the leading community film and video centre in the North West of the UK, hosting cultural events with visitors from Africa, Asia and Latin America as well as producing and distributing all kinds of radical film material in the UK. 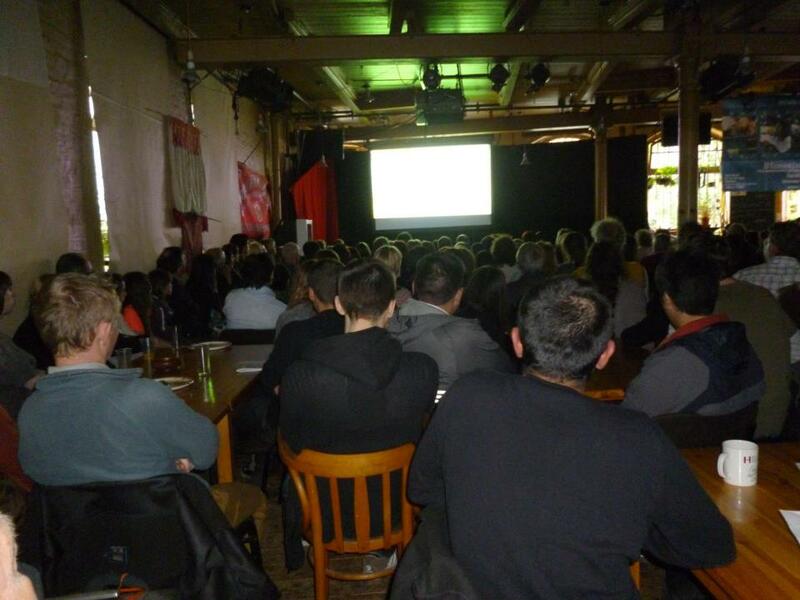 The second reason why so many turned out for this screening is that the filmmakers, writer-director Ana Lucía Cuevas and cinematographer-soundman Fred Coker are based in Greater Manchester and both have worked at WFA. The venue was as full as it could be with around 150 people and the doors closed to meet fire regulations. When the film began the audience quietened noticeably and well they might. This is a powerful and deeply moving film – not least because it combines a personal story and an important analysis of the political struggle in a Central American country. The CIA engineered a coup to topple the ‘socialist’ President Arbanz in 1954 and a succession of Army Generals became President in what was effectively a CIA puppet state. Guerrilla groups began to form in opposition and a Civil War began in Guatemala which lasted off and on until 1996. In the midst of the war the Guatemalan security forces – army and police – refined a number of terror tactics which ‘disappeared’ some 45,000 people. 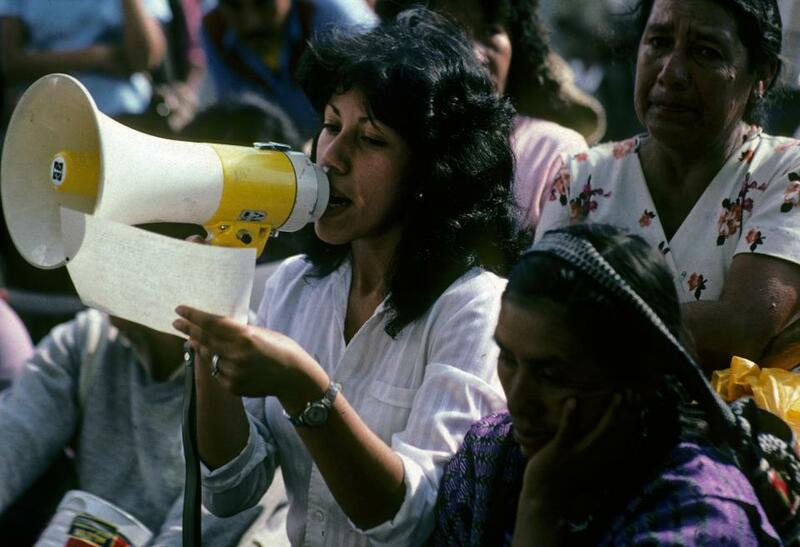 In 1984 Lucía Cuevas was a university student in Guatemala and like the rest of her family she had joined one of the major opposition groups in the country. She felt that her situation was so bad that she had to leave the country. A few months after her departure, her older brother Carlos, a student activist who was married and had a young son, was ‘disappeared’ by the security forces. Carlos was Lucía’s soul mate. Lucía came to Europe to complete her studies and she eventually settled in Manchester. With her friends and her surviving family she spent the next 25 years finding and trying to piece together evidence about what had happened – while at the same time struggling with the dilemma over remembering or trying to forget in order to be able to live your life. A few years ago when she was checking online for news from Guatemala she came across a report about newly discovered archives of material relating to the systematic ‘disappearances’ during the 1980s and 90s. She then resolved to go back to Guatemala to see if she could find more material evidence about what happened to Carlos. The film is a documentary record of her search – the title, from a poem, places her personal experience in the context of the many families who have experienced the pain of unexplained loss. The film narrative details Lucía’s research and is presented via new interviews and footage of her journey intercut with an impressive range of archive material. It is technically an ‘authored’ documentary, but unlike the filmmakers who ‘perform’ for their own camera, Lucía remains a remarkably composed interviewer and commentator – despite the shocking revelations she is witness to. The narrative is more or less chronological though some material is shifted back or forward to strengthen the engagement of the viewer. Lucía’s commentary stitches the material together elegantly. There is an unobtrusive and careful use of music and overall the film is beautifully photographed and edited. I’m not completely convinced by the decision to use fades to black at the end of each short sequence, but in his review Keith suggests that this allows the audience a moment to reflect on the import of what they have seen (and heard). The pre-credits sequence introduces a woman who acts as a witness to the horrendous treatment of the indigenous peoples of Guatemala, the rural population subject to the tactics of genocide as a means of terror. We then see Lucia in Guatemala arriving at a newly opened mass grave with forensic archaeology in progress. The first sequences of the film proper feature Lucia’s visit to meet Noam Chomsky and to get access to materials held by the National Security Archive Project in New York. In these sequences the documentary uses archive material alongside the interviews to explain how the American state supported the Guatemalan regime in every way possible including the collection and collation of surveillance data gathered through US Embassies in Central America. Chomsky explains that the Eisenhower administration in the 1950s described any form of local social reform in Central America as ‘communism’. The rest of the film is mainly concerned with Lucía’s investigations in Guatemala. What she finds is shocking and heartbreaking – particularly in relation to the fate of her brother’s wife Rosario and her baby son. Rosario and another of the young wives of the disappeared had formed a group to campaign for information about their loved ones but they were brutally dealt with by the authorities. Aspects of the history of terror are so horrible that the facts seem surreal. If I understood correctly the chroniclers of systemic terrorism kept meticulous accounts and didn’t destroy them after the 1996 Peace Accords because they assumed they had ‘impunity’. In 1995 an archive of a million documents was discovered! One of the most impressive aspects of the film is the number of resolute women, the relatives of the disappeared, who Lucía is able to interview. She concludes that for them, and for herself, the long investigations have two purposes. They must find answers to what happened to the disappeared because only then can they grieve properly (the terror of not knowing is the intended long-term consequence deliberately used by the security forces). But second, they must carry on the process of prosecuting the guilty parties in court. That process has produced only a small number of convictions so far, but it’s a start. Meanwhile, however, the ‘intellectual authors’ of the terrorism, the military commanders, are now politicians – members of parliament and presidential candidates. Most of the audience stayed for a discussion with Lucía and Fred. We were told that the film had been screened in Egypt and very much appreciated in a country where similar terror tactics had been used against the population. Someone suggested that it should be shown in Spain where legislation giving rights to those whose relatives were disappeared under Franco was passed only a few years ago. Someone else remarked that the surveillance of the population in the UK was increasing – many connections were being made around the political issues raised by the film. The film itself was praised in terms of filmmaking and the suggestion came that it could inspire younger Latin American filmmakers to explore previous documentary films from the region and help to recover the practice of social documentary. But the most emotional and heartfelt responses came from two Guatemalan women. A younger woman said that she had been shocked by what she had seen and that the film had opened her eyes to the history of her own country. She was very grateful – but urged us all to go to the country and see what a beautiful country it is. The other, older, woman who was part of Lucia’s family said that she felt able to speak about the terrible things that happened for the first time after seeing the film. This is an important film and must be seen. DVD and Blu-Ray versions of the film are available and we’ll post here how to get hold of them and any other information about screenings. There are some other links on our previous posting here. The main source of information about the film is its Facebook page from where we have borrowed the first three images above, the fourth is from us. Thanks to WFA, Lucía and Fred for an inspiring evening.